NASA has chosen a landing site for its next Mars rover with the goal of seeking more signs of historical water on the planet, and a recent study suggests it may find it. New evidence of Mars' watery past has surfaced, NASA scientists say, suggesting that telltale signs of the wet stuff may lurk under thin layers of rust seen scattered around the Red Planet, in areas that mirror conditions found in Earth's desert regions. Scientists have long known that Mars is home to a few patches of carbonates — minerals that form readily in large bodies of water and can point to a planet’s wet history — yet they suspect that many more carbonates may be hidden beneath the rust (iron oxide) that coats many regions of the planet. "It's possible that an important clue, the presence of carbonates, has largely escaped the notice of investigators trying to learn if liquid water once pooled on the Red Planet," said Janice Bishop, a planetary scientist at NASA's Ames Research Center at the SETI Institute at Moffett Field, Calif., in a statement. Scientists conduct field experiments in desert regions because the extremely dry conditions are similar to Mars. Researchers realized the importance of the varnish earlier this year when Bishop and Chris McKay, a planetary scientist at Ames, investigated carbonate rocks coated with iron oxides collected in the Mojave Desert. When the scientists examined the rusty varnish in the lab, they found it had tinkered with the spectral signature of carbonates hidden underneath. varnish. Scientists believe the varnish may have extended temporarily the time that Mars was habitable, as the planet's surface slowly dried up. "The organisms in the Mojave Desert are protected from deadly ultraviolet light by the iron oxide coating," McKay said. "This survival mechanism might have played a role if Mars once had life on the surface." NASA’s Mars Reconnaissance Orbiter (MRO) spacecraft found patches of carbonates, approximately 200 to 500 feet (60 to 150 meters) wide, on the Martian surface, yet the Mojave study suggests more patches may have been overlooked because their spectral signature could have been changed by the planet's pervasive rusty coating. 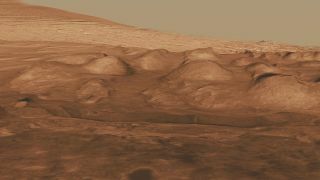 In fact, the rusty varnish is so widespread that NASA's Mars Exploration Rovers, Spirit and Opportunity, were equipped with motorized grinding tools to remove the rusty overcoat on rocks before other instruments could inspect them.